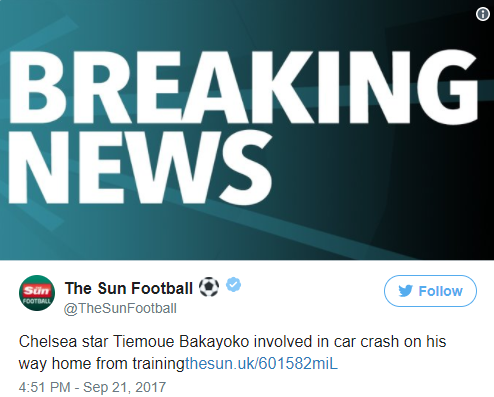 Yesterday, Chelsea midfielder Tiemoue Bakayoko was involved in a car crash as he was making his way from training. According to The Sun, the Frenchman was driving along Blundel Lane near the Blues' Cobham facilities around 3:30pm when the incident took place. He was said to be driving towards Oxshott, Surrey, and no one else was involved as police was immediately called to the scene. The 23-year-old joined Chelsea from Monaco in a deal worth £40million during the summer.